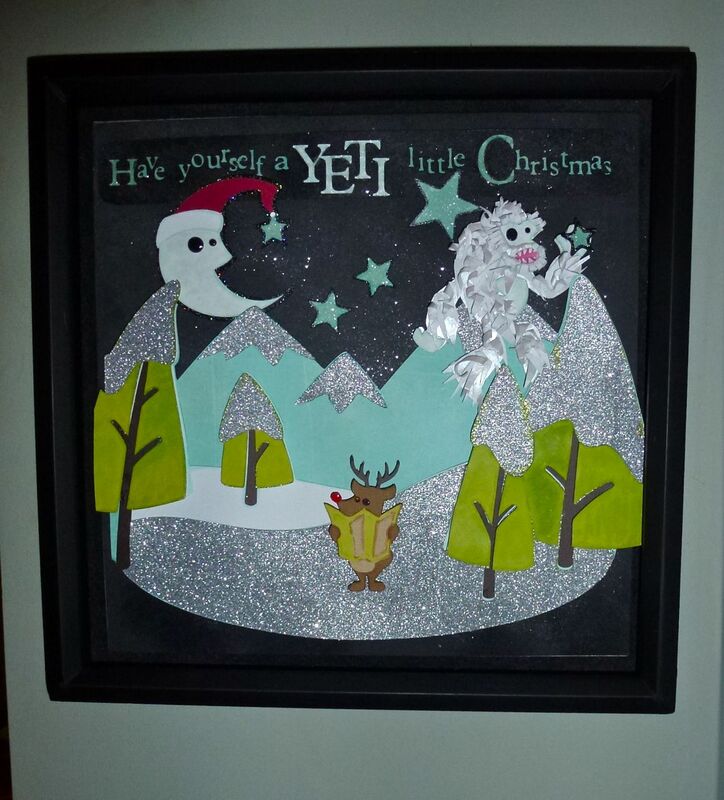 The first of the Cricut Christmas home decor projects is completed. 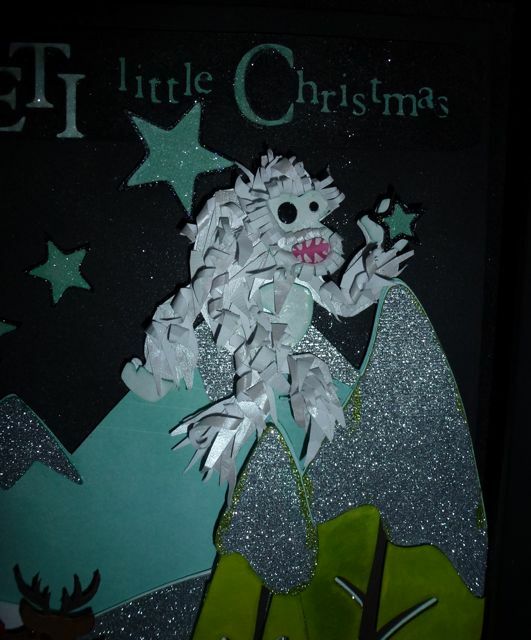 This is “Have yourself a Yeti little Christmas” and the big guy is getting ready to hang a shining star on the highest bough. All of the cuts on this project are from Campin’ Critters except for Plantin Schoolbook in the title. Using Big Foot (at 3″), I hand trimmed his down his big boots and added some hand cut and rolled fur. The most challenging aspect was his mouth and facial hair. I hand cut a pink polka dot from a piece of card stock, folded and trimmed to make a mouth, and added his gorgeous teeth with a Uni-Ball Signo Pen. The facial hair was hand cut and then fringed and rolled to attach. 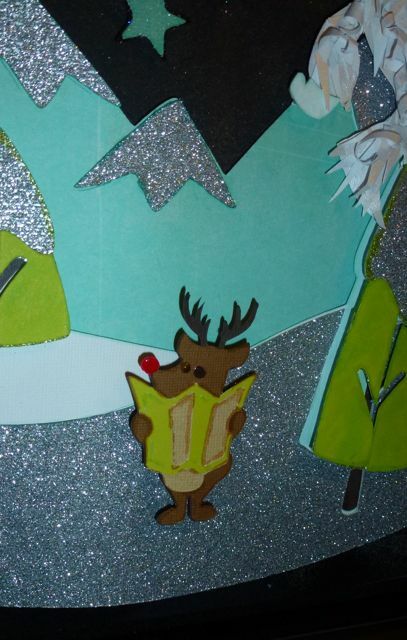 Rudolph has an added red nose and is checking his map because as lead reindeer, he is the team navigator. The illustrator of Campin’ Critters is holding a cartridge challenge on his blog. If you are interested in learning more, check it out here: http://typecastcreative.blogspot.com/2011/10/announcing-my-new-cartridge-challenge.html. I love this!!! Love the play on words, love how you transformed the Big Foot, love Rudolph checking his map! I hope I get some time to do this challenge! How fun! Lol…..I absolutely love this fun and fabulous piece of art. You are one of those amazing artists who gets better with every post – just when I think you can’t top yourself, you do. I love your yeti’s face. You did a great job making the mouth and adding the paper in just the right spots to give him the cutest face ever. Absolutely adorable. I’d love to hang this one in my kitchen for Christmas. Just my style. Fabulous art! Thanks for sharing! Outstanding!! I LOVE this :D. So clever and beautiful. I had to come back to look at the texture on the Yeti! I love that he looks both icy and furry. Love the paper you used and the technique. That mouth is too much! Very cute. I love the little play on words. Too funny. OH that bigfoot is just as cute as can be. You did a GREAT job on him. Oh and Ruddolph — I’ll help this little guy come to my house what great job.